See the description for Fuglabergsåsen. leave Hwy. 49 in Husa and take the signed road that forks left. After a bit more than a kilometer the road crosses the river. Immediately, on the other side of the river, a forest road forks right. Take this road. Quite soon, at location N60.02061, E005.80962, there is a gate. If it is closed, find parking that does not block the road. Hopefully, this gate is open, one should then drive this good forest road to location N60.03235, E005.83379, elevation about 150 meter. Park here, this is a very good trailhead. If you cannot drive to trailhead described above, (closed gate?) then walk this forest road to the trailhead first. From this trailhead, leave the main forest road and take the somewhat older forest rod that forks left at this location. follow this road until it runs into a very old forest road that comes from your left side and continues uphill to your right. Follow this old and somewhat rocky (in places) uphill mostly along a small creek. Continue until location N60.04914, E005.83532, elevation just short of 300 meter. You should then run into a trailfork with signs posted. Take the trail signed for Vardegga, it runs left and climbs the final slopes nicely. 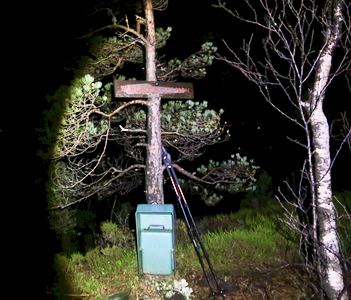 The summit has a sign as well as a summit register. I had already visited two small hills in the area and it was now dark. I decided to visit one more, this would be a complete night hike. The gate on the forest road was open and I drove to location N60.02876, E005.82618, where my map indicated that another forest road would fork left. 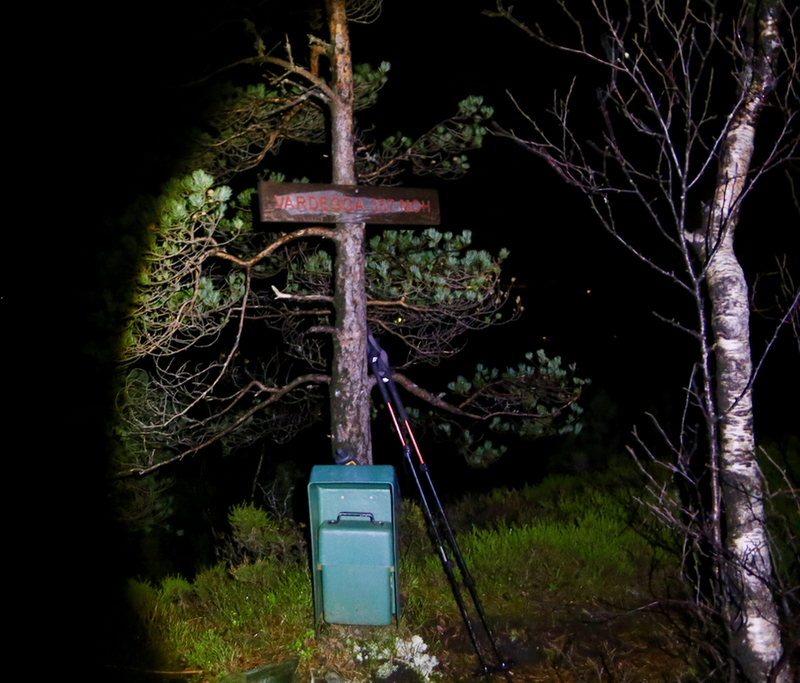 Leaving at 1820 with a strong head torch, I soon discovered that my connecting forest road was more forest than road. Still, it could be followed and after a while I ran into a much better forest road. The hiking was now easy until I had the summit straight up on my left side. I had no idea about the terrain, so decided to try a shortest path. This was a mistake. I ran into cliffs and generally complex terrain. The terrain forced me more to the right and suddenly, I ran into a T-marked trail. The rest was easy, arriving on top at 1930. I could see lights in several directions, this is obviously a nice viewpoint. I left at 1935, this time following the trail. An easy return hike where I also used the newer forest road connecting nicely with the main (forest) road. Back at 2015. I next drove to the trailhead for my planned first hike tomorrow. Sleeping in the car should get me off to an early start.